Seldom do I (seriously) thank her for everything that she has done for me. She has always been there to lend a hand, to comfort, to give advice, and to correct. She has always been the constant chatmate and email-mate when I get super bored at work. She has always been the logic when I am extremely emotional, remaining objective and above the situation. 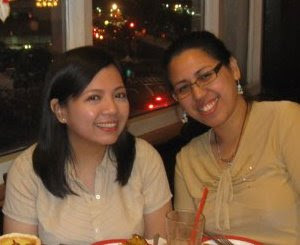 She was the first friend I had in college and will probably be the last one standing when I die. She never fails to listen, never judges out of context, and never grows tired of being a friend. Today, on her nth birthday, I honor her for her generosity with her time and resources; for her love for her family, friends, and future-husband Conrad; for her very very deep vessel of patience (especially with me! LOL); and for her unfailing faith in God. I pray for all her heart's desires to come true. I pray for even better relationships, good health, and more answered prayers. I pray that everything that heaven can provide be upon her. Thanks Pare for 11 years of enduring my being spoiled (pero hindi brat ha! LOL), leading the Kai Kada (este Bitter Girls na pala), and just being there. Thanks for being the best first friend ever! Happy birthday Mazel!